In the morning, you will be picked up at the lodge and taken to the Londorossi Gate (2,250 m). Here you will be registered by the national park authorities. Then you will drive an approximate 15 km on a bumpy track that will take you into the dense rainforest to the drop-off point where your trek begins. You will follow a moderately steep track, which leads you through an amazing and unspoilt natural forest to the Big Tree Camp, your destination for today. As this region is also home to wild game, you will be accompanied by an armed ranger during the first 2 days of your trek. Today’s long trek starts on a small trail that passes through the rainforest. As one climbs, the forest gradually thins out and the landscape changes into heath and moorland where plants like erica and lobelia start to dominate the landscape. 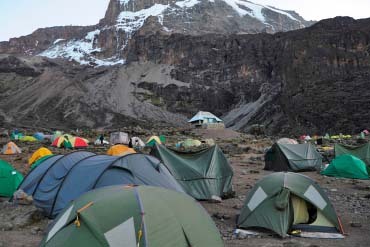 You will cross the Shira Ridge and after 4 to 5 hours of trekking, you will reach the Shira Camp 1. Here you will stop for lunch, relax a bit and enjoy the fantastic views of Mt Meru and the Rift Valley. For the last part of the climb (approximately 3 hours), you will climb another 250 m in altitude. The landscape will change again and you will pass giant senecios that can grow to almost 9 m in height. 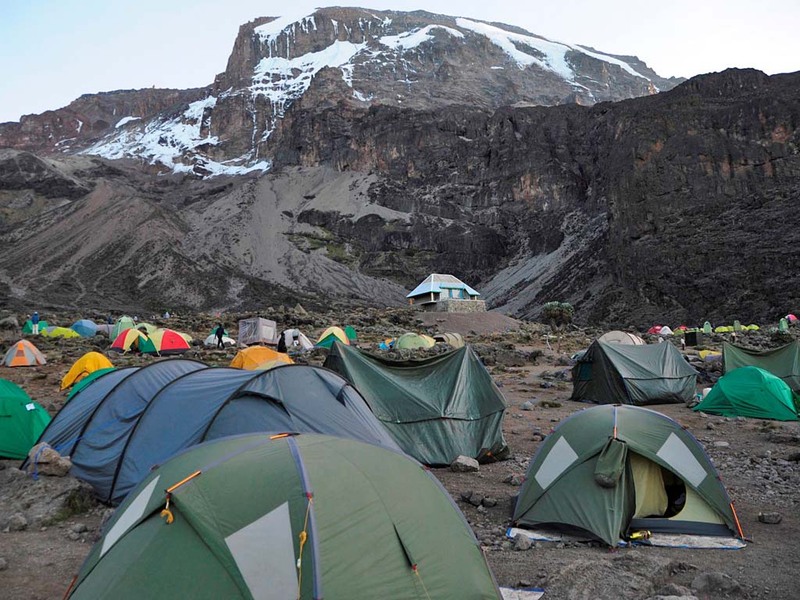 At Shira Camp 2, you will camp for the night and with a little luck, enjoy the wonderful view of the Kibo summit at sunset. Today you will climb approximately 700 m, but you will spend the night at an elevation only slightly higher than the previous night. This will allow your body to acclimatise, as a height of over 4,600 m will be reached before descending again. In doing so, you will be able to see how your body reacts to such an altitude. The trek begins with a long ascent above the Shira Plateau in the direction of the Lava Tower. The vegetation becomes sparser as the landscape changes to alpine desert. 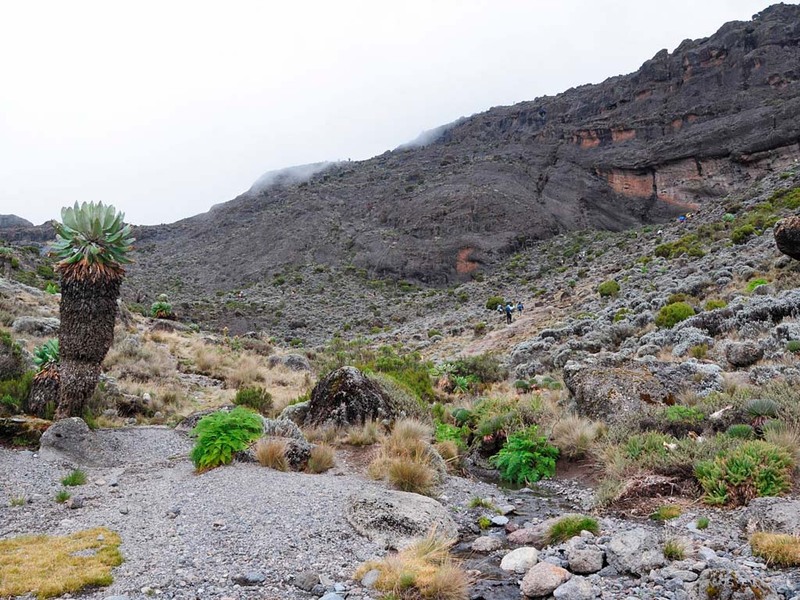 The climb passes through the wide Barranco Valley with its lobelia and giant senecio plants. 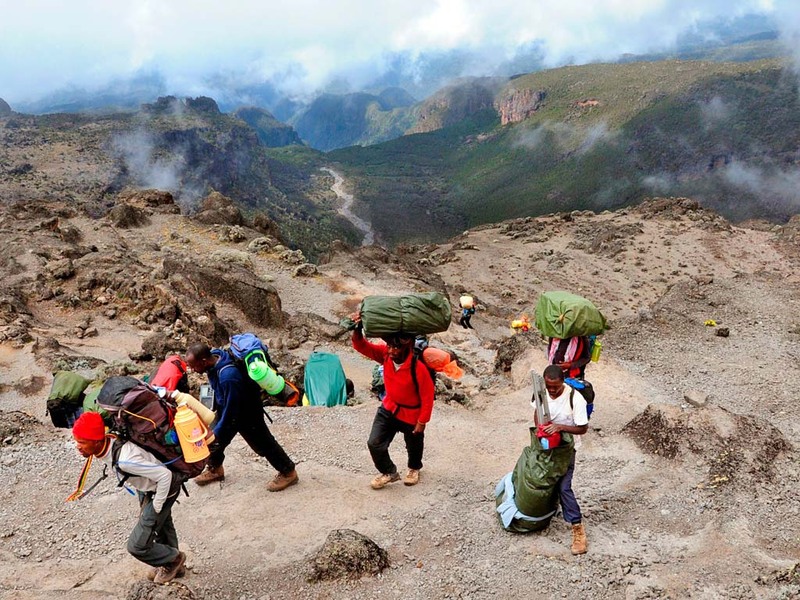 After 6 to 7 hours’ walking, you will arrive at the Barranco Camp – perhaps the most beautiful camp on Kilimanjaro. 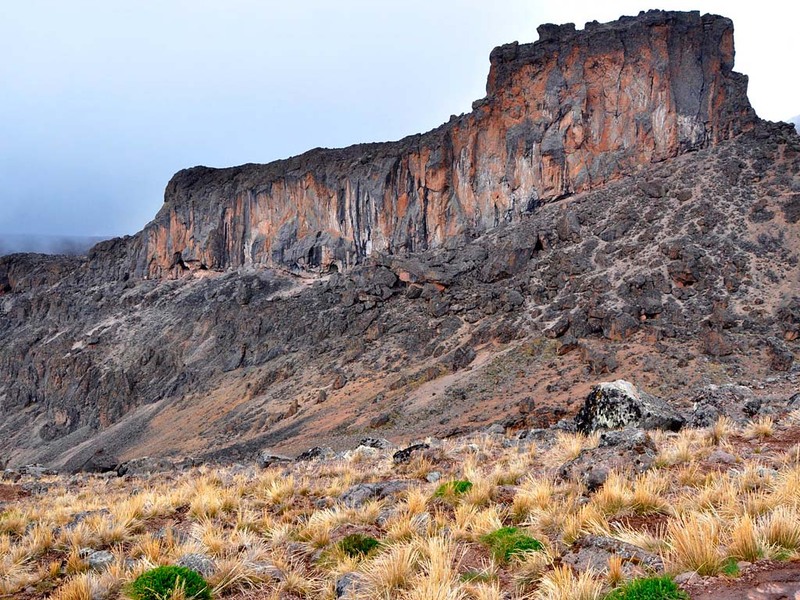 After breakfast you will walk along a trail that passes through an alpine desert area until you reach the destination of today – the Barafu Camp. In the afternoon you can relax and stretch your legs in preparation of the upcoming summit night. You will have dinner early in order to catch a few hours’ sleep, before you will be woken up at around midnight. After some hot tea and a light snack, the climb begins at around midnight. By torchlight you will start walking on the lava ash that is still frozen. 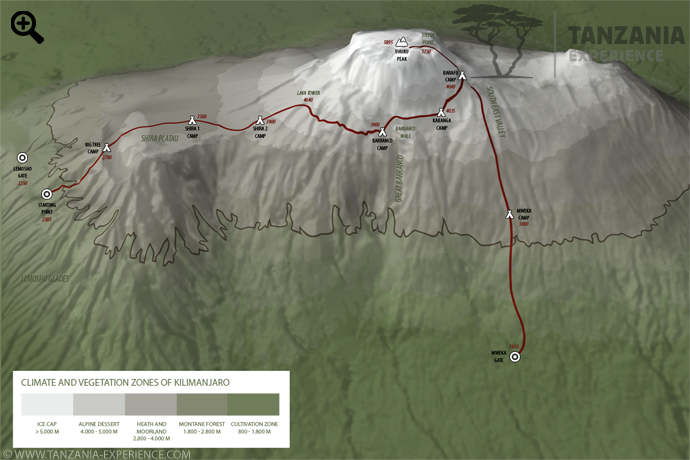 After 5 to 7 hours you will arrive at Stella Point (5,730 m), the crater rim of Mt Kilimanjaro. 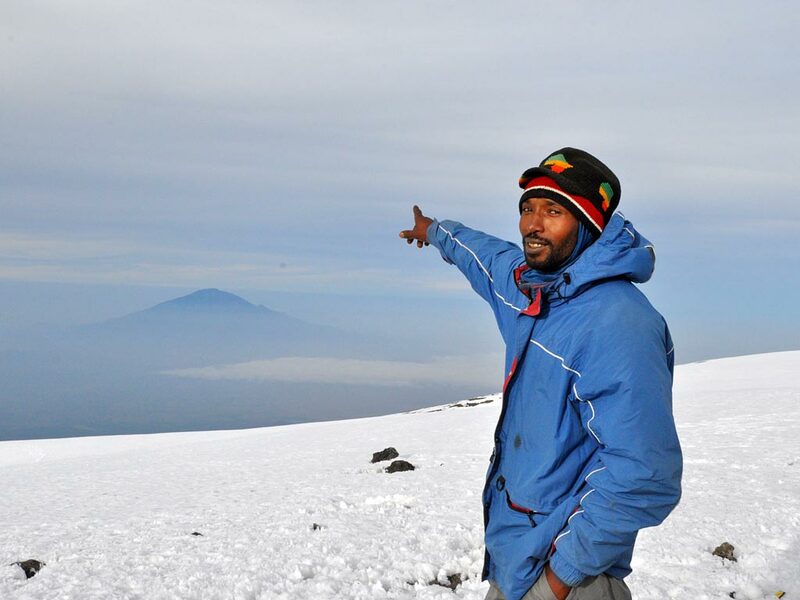 Another 1 to 2 hours climb along the crater ridge will lead you to the summit of Uhuru Peak. From “Africa’s Roof”, you will be able to see the surrounding landscape being lit up by the rising sun – a truly liberating experience. After a short break and taking photos, you will return to Barafu Camp just before midday where the rest of the crew will be waiting for you. You will have a warm lunch and rest for about 1 to 2 hours before you make our way down to the Mweka Camp about 3 hours away. The final leg of your amazing adventure begins after breakfast with a traditional farewell ceremony from the mountain crew. Then a gentle 2 to 3 hours’ descent through the rainforest continues to Mweka Gate, where your driver will be waiting for you. 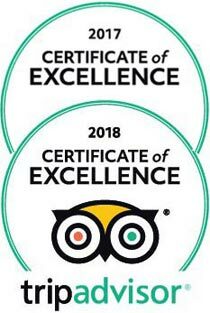 He will take you back to the Meru View Lodge and after a warm shower, the rest of the day is free to rest or to celebrate your achievement.